To enforce parking laws and regulations at the Michael E. DeBakey VA Medical Center and to free up parking spaces for our Veterans, all parking lots will soon be gated. Veterans: Free parking! When you pull into a parking lot, pull a ticket. A clerk in your clinic will validate it. Use the validated ticket to leave the parking lot. Families of Veterans: Free parking! When you pull into a parking lot, pull a ticket. A clerk, in the clinic or nursing unit you are visiting, will validate it. Use the validated ticket to leave the parking lot. Visitors: Depending on your business at the VA, you may have to pay to park on the VA complex. Volunteers: Free parking! You will receive information from the Volunteer Services Office about how to swap your hang tag for a new one in the near future. Employees: Free parking! You will receive information about how to swap your hang tag for a new one in the near future. Certain parking lots will be designated for your use. PARKING GARAGE: Construction of a new parking garage will begin the end of 2011. Parking Lot N near the Almeda Gate will be blocked until this garage is finished. Another parking garage is planned near Cambridge. During construction, off-site parking with shuttle service will be available. Your cooperation, flexibility, and assistance are greatly appreciated as this parking improvement initiative is implemented. Check your email for future updates. While many people associate the flu with cold weather, the Center for Disease Control and Prevention recommends getting a shot as soon as the vaccine becomes available. It is really never too early – or too late – to get vaccinated. “It takes about two weeks for the protection to kick in after a flu shot is administered. While it may seem like the sooner the better, the greatest benefit of getting vaccinated now may be peace of mind,” said Primary Care Director Nicholas Masozera, M.D. Free flu shots are now available for Veterans, Monday - Friday, 8 a.m. - 4 p.m. at the Michael E. DeBakey VA Medical Center in Houston and its outpatient clinics in Beaumont, Conroe, Galveston, Lufkin, Richmond, and Texas City. Charles Wilson VA Outpatient Clinic, Lufkin - Please call 936-671-4300 for scheduled flu shot clinics. A new VA outpatient clinic in Lake Jackson will open for patient care on October 11, 2011. The clinic will be located at 208 South Oak Drive, Suites 700 and 800, Lake Jackson, 77566 near the Post Office and the Brazosport Regional Health System complex. An average of 36,000 Americans die each year from influenza and many of them are the unvaccinated elderly. No vaccine is 100 percent effective, but the flu vaccine very clearly decreases the chance of severe illness, death, hospitalizations, and lost work days. Flu shots do not cause flu illness. The influenza viruses contained in a flu shot are inactivated (killed), which means they cannot cause infection. Flu vaccine manufacturers kill the viruses used in the vaccine during the process of making vaccine, and batches of flu vaccine are tested to make sure they are safe. In randomized, blind studies, where some people get flu shots and others get salt-water shots, the only differences in symptoms was increased soreness in the arm and redness at the injection site among people who got the flu shot. There were no differences in terms of body aches, fever, cough, runny nose, or sore throat. For more information about influenza and the flu vaccine, contact the Preventive Medicine Program at the Michael E. DeBakey VA Medical Center at 713-794-8768 or visit the CDC website at http://www.cdc.gov/flu. And remember, it is important for everyone use good hygiene practices to prevent the spread of disease. Wash your hands frequently. Join the Fund for Veterans' Assistance (FVA) program and potential applicants on Wednesday, June 26, 2013 at 10:00AM - 12:00PM (Austin, Texas Time) for an Informational Application Webinar to review the current Series XIV-A Request for Applications (RFA), now open through August 8, 2013. This two hour webinar is free of charge and hosted by FVA staff. Potential applicants are encouraged to join the webinar to learn more about this grant opportunity. If you would like to reserve a spot at the webinar, please register here. Please visit the Texas Veteran's Commission Website within the next few days for more additional information regarding the Series XIV-A application. May 17th, 18th, and 19th. Unit 1 meeting on Sunday the 19th. Come out and join in the activities. LAVFW 12024, a veterans organization and a non-profit 501 c19 public benefit corporation, invites you to apply to participate in their Spring Fling Craft Show exhibition. We look forward to hearing from you. Saturday May 4, 2013, from 9 am - 5 pm, set-up is Saturday beginning at 7:00 am. Volunteers will be on hand to help unload your vehicle and carry your merchandise to your space. You must be completely set up and ready for business by 9 a.m. Tear down begins at 4:00 pm, and must be complete by 6:00 p.m. The Texas Capitol Vietnam Veterans Monument will celebrate its Groundbreaking on March 24 and 25 in Austin with a special tribute to the Texans who died in the Vietnam War. All Texas Vietnam veterans are invited to attend the events which are free and open to the public. On March 24 a Reading of the Names of the 3,417 Texans who died in Vietnam will be held at the Lyndon B. Johnson Presidential Library auditorium from 8:30 - 5:30. On the same day, the Texas Vietnam Heroes Exhibit of 3,417 hand-stamped dog tags honoring each Texan will open in the Great Hall of the LBJ Library. An evening reception for veterans and families will be held at 6:00 p.m. at Austin's historic Scholz Garten. The monument Groundbreaking Ceremony will take place on the Texas Capitol Grounds at 10:00 a.m. on March 25. Texan Joe Galloway will deliver the keynote address. Full information, including how to make reservations for the reception, is available at http://buildthemonument.org/groundbreaking-events. The Texas Capitol Vietnam Veterans Monument will honor all Texans who served in the Vietnam War. The 3,417 Texas Heroes of the war will be individually remembered by the entombment of personalized dog tags bearing their name, rank, branch of service, hometown and date of loss. The tags will be dedicated for entombment during the Groundbreaking. The people of Bastrop will host a Receiving Ceremony at 2:00 p.m. at the Heart of Texas Art Foundry where the monument is being built. The monument will be available for public viewing. The Texas Capitol Vietnam Veterans Monument will be dedicated in the fall of 2013. Please visit www.buildthemonument.org to learn more. Sign the Petition on the White House to lower the designation of the new proposed Distinguished Warfare Medal. This should not be ranked higher than the Bronze Star or the Purple Heart, it should be no higher than an Achievement Medal, it's an injustice to those Veterans of Foreign Wars that have been on the front lines, putting their lives on the line. There needs to be at least 100,000 signatures by March 16th, at the time of this posting, there are close to 17,000. Please sign up and continue to Honor our true Nations Heroes. Make sure to stop by at the next Post and Auxiliary meeting on March 7th, 2013, to pick up your free Post Bumper Sticker. Limited to 250, available while supplies last, limit 1 per person. The Woodlands is getting another Veterans Memorial @ Town Green Park. They are asking for donation of $200.00 for a granite tile with the Veterans name, Branch of service or other info you wish to have engraved on the granite tile. the black granite tile will become part of the base of the memorial in Town Green Park. VFW Ladies Auxiliary 12024 The Woodlands are proud to sponsor their annual Banjo Show, Jan 27, 2013 3pm College Park High School, The Woodlands. Tickets are $10 at the door. Veterans and Active Military FREE with ID. Proceeds to benefit Veterans and Veteran projects. 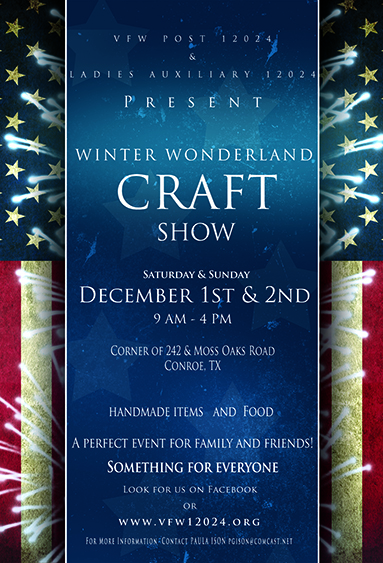 We’ll also have “Santa” on site….our Craft Show just gets better & better…. Please join us next Sat, Nov 17 at 10:00 a.m. at Forest Park Cemetery to honor and remember young Pfc. Kyle Holder with the planting of a Live Oak tree. It has been 2 years exactly since Pfc. Holder gave his life for his country and with Veterans Day upon us, what a wonderful way to say Thank You to a family who has lost so much. Please wear your VFW Pride, we will have hand held flags on hand and also be placing a wreath at his gravesite. Each year, the Woodlands Bar Association conducts a Wills for Heroes program. This year, we have selected veterans as the group of heroes whom we wish to serve. Under the program, we offer will preparation services, which include preparing Powers of Attorney and Health Care Directive forms for veterans in need, as well as their spouses free of charge. There is no catch, no fees or other compensation are expected nor will they be accepted and we are not soliciting donations. what we need is to reach as many veterans as possible who may have the need for basic will preparation. The first step is identifying approximately how many individuals have a need so that we can select an appropriate venue in the county. Once we have a general idea of how many people are interested, we will select the site and date of the will signing ceremony and in the interim, match each veteran and their spouse up with one of our volunteer attorneys so that the drafting can begin. At this time, we are targeting a Saturday in late October for the ceremony, but again, it is contingent upon making sure there is enough of a need. Would you please help us in spreading the word to all vets in Montgomery County and surrounding areas, and if you would kindly report back how many individuals have an interest in receiving these services, we start the planning. For new KWVA members, the eligibility requirements are on the KWVA web site: www.kwva.org or below the "Revisit" application form in the Graybeards magazine. Please be reminded that these sponsored tours are subsidized. All expense's in Korea (minus incidental's) are paid for by the ROK government. Additonally, 50%) of the veterans airfare and 30% of the spouse/companion's air, will be reimbursed to you, upon completion of the tour. This includes both your domestic and international airfare, from your hometown to Seoul, and return. These quotas go very fast, so if you're interested, don't hesitate to register. You can always cancel for health reasons, but when the space is gone, it's gone! Please call our office at 800-722-9501 or 703-590-1295. You can also email us at: JWiedhahn@miltours.com. New for 2012: Military Historical Tours will be offering optional pre tours to the Chorwon Valley in the North, along the DMZ, or the Pusan Perimier in the South. The other option's are a post tour to Beijing and Xian, China, or Vienam. (The optional tours are at your expense). A question often asked: Can we take an additional son/daughter/friend with us to see where I fought during the war? Answer: Absolutely! However, the additional person's air, meals and hotel will be at your expense. They can ride the tour bus, visit the DMZ and attend the award banquet with you, gratis. 1950 Korean War Veteran - Pusan, Inchon, Seoul and "Chosin"
Congratulations to our Very own Lee Derby for running for State Jr. Vice-Commander of Texas. Lee Derby has had much success in the VFW, including being the Post Commander for 3 years and helping the Woodlands achieve All-State Post 6 years in a row and being part of the 2 All-American Post. Lee has continued his success with being the District 17 commander twice and continues his VFW efforts assisting and helping Veterans at the Post, District and State levels of the VFW. This picture was taken from the November Release of the Texas VFW magazine at TexasVFW.org. You can download a copy of the magazine from this web site by right clicking on download and selecting save as. Join us for our monthly Veterans’ Breakfast, with special guest hosts and speakers. Gather with fellow veterans and The Forum team for a wonderful morning and a fabulous breakfast! Kindly RSVP to 281-367-3170. Its Relay for Life time again! Help me make a difference​! This year, over 1.4 million Americans will hear the words "You have cancer". I know too many people who are touched by cancer, and that is why I have joined the American Cancer Society on a mission to save lives and create a world with more birthdays by participating in the Relay For Life in my community. At Relay For Life we celebrate loved ones who have won their battle against cancer, remember those who are no longer with us, and fight back against this disease that touches so many. I am determined to make a difference, and I hope you will join me. I will be walking on Friday May 11, 2012 at Klein Oak High School. Please, support me in my efforts by using the link below to visit my personal web page and make a donation. Every dollar raised brings us one dollar closer to a cure, and to a time when the number of people who have to hear the words "you have cancer" is zero. Thank you so much for your support. Together, we ARE saving lives and creating a world with more birthdays! The quarterly District 17 meeting is taking place at the Floyd E Breedlove VFW Post 8192 at 6206 George Bush Drive in Katy Texas 77492, April 28th, 2012 from 10 a.m. to 2 p.m. Each post in the district is responsible for sending at least 1 officer to this meeting for the VFW and Ladies Auxiliary. 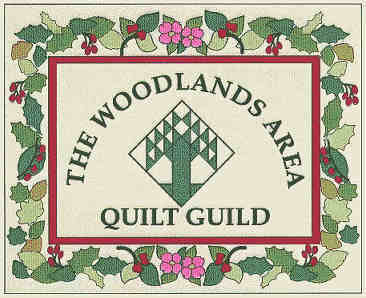 We have received a call from The Woodlands Quilt Guild for their April 2012 Quilt Show. They want us…The VFW Post to perform the Flag Raising for them on April 13, approx 10am, for their Quilt Show entitled Celebrate America. Quilts of Valor!! It will be here in The Woodlands (Legends)….will get more def. info as it gets closer. Beginning January 1, 2012 and continuing to April 1, 2012, registration will be open for the 2012 Mid-America Bike Week. This event is a major fundraiser for disabled Veterans and their families. Details about this event can be reviewed online at www.Mid-AmericaBikeWeek.org. Registration forms and payment details can also be found there. Hotels in the area are on a first come, first serve basis. Some of our hotels have been designated for specific riders with a common interest. They can be found on our ACTIVITIES page online. If you have any questions feel free to ask at anytime. Thank you. March 1 – VOD / PP Appreciation, along with Community Appreciation at Regular VFW Meeting, 7 p.m. at the South County Community Center in The Woodlands Texas. Veteran designation on Texas driver’s license is now available! The Department of Public Safety shall include the designation “VETERAN” on the face of any class or type of Texas driver license issued to a Veteran in compliance with Section 521.1235 of the Texas Transportation Code. To be eligible for the Veteran designation to be placed on their driver license, the Veteran must present a DD-214 or DD-215 (corrected copy of DD-214), signifying they received an honorable discharge orgeneral (under honorable conditions) from the branch of service in which the person served. I’m the Contract Manager for a Department of Defense engineering company here is Humble Texas. We are a Service Disabled Veteran Owned Small Business (SBVOSB) dedicated to working with the military and their requirements. Our company, Skylla Engineering, is hosting a fundraising golf tournament at The Woodlands Country Club on the exclusive Tournament Course on Monday, February 27 to benefit the Semper Fi Fund. The Semper Fi Fund (SFF) is a non-profit 501(c)(3) that assists with injured military coming back from overseas efforts with short and long term injuries. The SFF is a remarkable organization and was ranked by MSN Money as one of the highest ranked charities in America, issuing over 37,000 grants to severely wounded service members. The basic ideal that drives the efforts of the Semper Fi Fund is simple: as much as these American heroes have sacrificed, they deserve the best care and support available in their hour of need. Injuries are often severe, and the road to recovery or rehabilitation can be long and costly. Skylla Engineering will absorbing all costs associated with hosting this event (cart, greens fees, awards, meal) in order to maximize contributions to the SFF. 100% of registration fees and sponsorship contributions will go directly to the SFF and impact the lives of young wounded Marines, Sailors, Soldiers and their families during their time of need at the hospitals and as they transition back home to their recovery. With the fighting in Afghanistan, the needs of our wounded heroes continue to be great and your support will ensure that we are able to keep our mission moving forward. The brave heroes we serve will have a greater opportunity to strive beyond their injury and regain their independence because of you. Twilight tee off at 1pm followed by awards dinner. · TX – SPONSOR Skylla for Semper Fi Golf.pdf – This file contains all of the corporate sponsorship levels and registration sheet to be submitted with payment. We definitely want to get out there and collect checks as soon as possible. NOTE: Checks should be made payable to “Semper Fi Fund” and “Skylla Eng” written in the memo line. All sponsorships should be submitted to Mr. Postorino. · TX – INDIV Registration Skylla for Semper Fi Golf.pdf – This file has the registration sheet for individuals and teams. Please distribute as you see fit! · Texas Golf Tournament.pdf – This is the general promotional flyer to be used to advertise the event. If you create your own flyer, please let me know so that I may submit it to the Semper Fi Fund for approval, as there are restrictions for the use of their name/logo. · If potential sponsors request the Semper Fi Fund W-9 or a 501(c)(3) document from the IRS, I have these available, just let me know.
. If potential sponsors request to donate online via credit card, we have a way to do this but it isn’t the most ideal process. Just shoot me an email requesting online donation instructions. For more information about the Semper Fi Fund, visit: www.SemperFiFund.org. If you have ANY questions, or if I can help you in any way, please do not hesitate to contact me at any time! Thank you! Feb 16, Thurs 9 a.m. – Teacher’s Appreciation Glen Loch Elementary, and possibly 2 other schools…..
Greeting to all in District 17. Our district just reached 95.25% in membership. Way to go and keep up the great work. Our next goal is 98% by the end of March. Then it's on to the big 100% in May. If your trying to be an "All State Post" this year remember that you get an extra 10 points for every 1% you go over 100% in membership. The sooner you make it and continue to sign up new members, the better chance you have to finish in the "Top 20." It's time to start our "Spring Offensive." Post Publication, Post Nomination for Quartermaster, Chaplain, and or Service Officer, Post Volunteer, and National Delegate Dues. Sinking of U.S.S. Maine (February 15.) This is the last one to get credit on this year's status sheet. We still have 8 post that have not made a donation to the Homeless Veterans. What, too much food for 1 person, please feel free to “pair” up and share a plate? Just right portion and cuts the costs…..
A New Business has been created in The Woodlands Texas, the name of this company is Veteran Exterior Services. It's a Veteran Owned and Operated Business that employs Veterans that might otherwise have trouble finding work due to the lack of applicable training in today's job market. Window Washing, Pressure Washing, Gutter Cleaning, and other Odd Jobs. 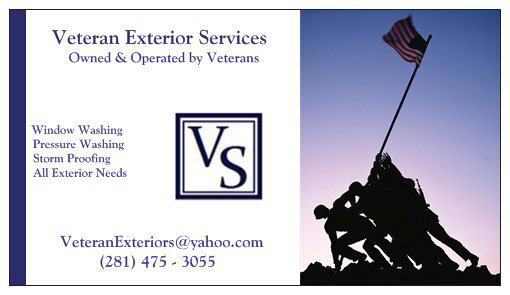 Please help this Business Prosper, as they are helping Veterans in an important way with trying to provide more jobs in The Woodlands for other Veteras. You can download the flyer and email it to all that you know in THe Woodlands to show your support and appreciation for what they are trying to accomplish. The two Veterans that Own and Operate this Business are also VFW eligible and will be joining the Post in the near future, and we might have a new member or two for the Ladies Auxiliary. Army E4 Philip Gherardini served 4 years and served a tour in Iraq and currently is in the National Guard Reserves. Army Staff Sergeant Gregory M. Stapleton served 8 years, he deployed twice to Iraq and once to Afghanistan. Washington—U.S. Rep. Lloyd Doggett (D-Texas), a senior member of the Ways and Means Committee, introduced bipartisan legislation with Reps. Chris Gibson (R-NY), Tim Walz (D-MN) and Danny Rehberg (R-MT) that would extend coverage and associated benefits with “Agent Orange” exposure to an additional group of Vietnam Veterans. The Blue Water Navy Vietnam Veterans Act of 2011 (H.R. 3612) would allow “blue water” veterans who served up to 12 miles off-shore in Vietnam presumptive coverage for Agent Orange exposure. This would enable them to receive Veterans Affairs (VA) benefits if they suffer from any of the diseases the U.S. government has linked to Agent Orange. Senators Kirsten Gillibrand (D-NY) and Lindsey Graham (R-SC) introduced similar legislation in the Senate. Austinite Morgan Little, Chairman of the Texas Coalition of Veterans Organizations, praised Congressman Doggett for his efforts on behalf of the “blue water” veterans. “Until now, one may	have thought the Blue Water Navy was fighting a different war,” he said. “I am pleased Representative Doggett filed this bill that could eventually mean the difference between being granted the benefits that I earned when I served in Vietnam and was exposed to Agent Orange, or not.” Little, a retired 30-year Navy Reserve Captain with broad command experience served in Vietnam in 1969 and was later diagnosed with cancer. With no family history of this type of disease, Little strongly believes his illness stems to his service in Vietnam and his subsequent exposure to Agent Orange. During the Vietnam War, more than 20 million gallons of the herbicide “Agent Orange” was sprayed to remove jungle foliage. A toxic chemical in the herbicide called dioxin was linked to devastating health effects, including non-Hodgkin’s Lymphoma, prostate and other cancers, Type II Diabetes, and Parkinson’s disease. In 1991, legislation was enacted that empowered the Secretary of Veterans Affairs to declare certain illnesses “presumptive” to exposure to Agent Orange and enabled Vietnam veterans to receive disability compensation for these related conditions. However, in 2002, the VA limited the scope of the Act to only those veterans who could provide orders for “boots on the ground” in Vietnam. Boots on the ground encompassed infantry and the riverine navy. As a result, veterans who served in the	waters off the coast of Vietnam, commonly called “blue water veterans,” were forced to file individual claims with the VA to restore their benefits, which are then decided on a case-by-case basis. The VA has denied 32,880 such claims through 2009. A May 2011 report issued by the Institute of Medicine concluded that plausible routes of exposure to Agent Orange exist for blue water veterans. Presumptive coverage lifts the burden from the individual veteran to prove direct exposure to Agent Orange - a nearly impossible task due to a lack of record keeping and the inability	to know the precise location of dioxins in the air and groundwater runoff - and extends the same presumption that currently exists for veterans who served on land and inland waterways. It would also reduce backlogged VA claims by automatically covering claims for disability compensation from these veterans who are suffering from diseases that the U.S. government has linked to Agent Orange. “When our warriors return home, they should always be given the benefit of the doubt, and we have an obligation to ensure that they receive the care and benefits they earned. This legislation is our opportunity to right a wrong and will ensure we fulfill the moral responsibility we owe to the men and women who have served this	country,” said Congressman Walz. The legislation was referred to the House Committee on Veterans Affairs. The following is for your information and action. Please respond to me at paladin_jam@yahoo.com or Don Dorsey at dondorsey@sbcglobal.net. Time is short so please get the word out to your members asap. Thanks for your support. To all Texas Vietnam Veterans. Am generating a list of potential candidates for filming by Arrowhead Films. Please read the following and respond to me (or John Miterko) with contact info if you have an interest in participating. Please include your home town, ethnicity, and military information (branch of service, rank, specialty, years of Vietnam service). Our goal is to represent the diversity within our ranks. Based on information provided, final decisions will be made by Arrowhead Films. 1) Must be a Texas Vietnam veteran (entered military service from a Texas city/town and served in-country, in the air, or off the coast of Vietnam in direct support of forces ashore). 2) Represent the diversity of the US military services and combat/support roles (grunt, artillery, air, sea, nurse, etc) in Vietnam. 3) Represent the ethnic diversity of Texans that served in Vietnam. Veterans selected for taping will be vetted and must be able to prove their status using a copy of DD-214 for example. If you can assist, please respond to John Miterko or Don Dorsey as appropriate as soon as possible. *Financial guidelines apply for free legal representation. Clinic open to all U.S. veterans or spouses of deceased veterans. No Appointment necessary. For more information please call 713-759-1133 or go to the web site www.hba.org. I strongly urge you to co-sponsor and support S 1629, the Agent Orange Equity Act of 2011, introduced by Sen Gillibrand. This legislation would expand the legal presumption of exposure to Agent Orange for veterans who served in the vicinity of Viet Nam. Before 2002, it didn't matter where a veteran served in the Vietnam War. If disabled due to the exposure to the terrible poisons in the air and waterways, VA would pay disability compensation. In February 2002, Congress decided to 'save our taxpayers money' and ordered VA to implement a 'boots on the ground' policy. After this policy revision, only service members who actually set foot on the ground in Vietnam could get compensated for medical conditions caused by Agent Orange and other herbicides that were routinely sprayed. The soldiers, sailors, airmen and Marines serving in Thailand, Cambodia, Laos and the China Sea were exempt from payment even though they were contaminated by these toxins just like their brothers in arms who served on the ground, in Vietnam itself. Title 38 US Code Section 1116, defines a Viet Nam veteran as "a veteran who, during active military, naval, or air service, served in the Republic of Vietnam during the period beginning on January 9, 1962, and ending on May 7, 1975." The Department of Veterans Affairs follows the Congressional mandate of "boots on the ground" which excludes most Navy and Air Force personnel who have Agent Orange related issues but who can not prove "boots on the ground." 1. Compensation by amending Title 38, Section 1116, Subsections (a)(1) and (f) by inserting '(including the territorial seas of such Republic)' after 'served in the Republic of Vietnam' each place it appears. Again, please co-sponsor and actively support S 1629. Further please due all within your powers of moral suasion to have this legislation included in the 2010 National Defense Authorization Act that will soon be negotiated in Joint Committee. The quarterly District 17 meeting is taking place at the Piney Woods Post #4816 at 24411 Cunningham Drive, Porter, Texas 77365, February 4th, 2012 from 10 a.m. to 2 p.m. Each post in the district is responsible for sending at least 1 officer to this meeting for the VFW and Ladies Auxiliary. The Texas Legislature has made significant changes to the requirements for homestead exemptions. These affect all types of homestead exemptions, not just the regular homestead exemptions. The changes also affect over-65 exemptions, over-55 surviving spouse exemptions, disability exemptions, and the 100% Disabled Veteran exemptions (all of which are considered homestead exemptions). The following link outlines the new requirements. VFW Post 12024, would like to Welcome Joe back to the Post in The Woodlands Texas. Joe had not had the opportunity to attend any meetings or events over the last few years and is now trying to become active with the Post again. Joe was a disbursing clerk in the Navy. He was discharged as a DK2(SW) an E5. He served on the USS Phillipine Sea CG58 during Desert Storm to gain eligibility for the VFW. Please reach out to the Post new members, VFW and Auxiliary at the next meeting and Post events and introduce yourselves to them personally, let‘s use some of that charm and southern hospitality to make these new members feel welcomed. Congratulations to Susan Huff for being the Ladies Auxiliary 12024 member of the month for January. Susan is the Grand Daugher of a World War II Veteran. She is very active within the Auxiliary and also is a Girl Scout Leader. Susan is a Native Houstonian, new to the post within the last year, she is a great example of pitching in and helping us at the Post and also in the Community. VFW Post 12024, would like to Welcome Jerry Tuggle, one of the newest VFW Post members at The Woodlands Texas. Jerry joined the Post on January 4th, 2012, during the Post monthly meeting. Jerry transferred from a Post in Ohio. He served in the Air Force and was stationed in Korea for his VFW Eligibility with last rank as an E4. Jerry's son is currently in the Air Force and getting ready to be deployed Overseas as an Aerial Gunner in a AC-130. VFW Ladies Auxiliary 12024, would like to Welcome Doris Sims, the newest Auxiliary members at The Woodlands Texas. Doris is married to Post member Derrell Sims, who joined the Post on December 1st, 2011, during the Post monthly meeting. He served in the Army and ended his career as a Staff Sergeant, with his VFW Eligibility from serving in Korea. This email is to inform you of a possible veteran scam operation from Oklahoma that may be setting up shop in the DFW metroplex or elsewhere in Texas. KFOR-TV (NBC Channel4) in Oklahoma City has reported recently on an “organization” by the name of Veteran’s Outreach Mission Inc. run by a man named Bruce Wayne Rhoades aka Rhodes & Sawyer. The short of it is, Mr. Rhoades who is currently a wanted convicted felon out of Oklahoma County, ran a house raffle in Oklahoma City and collected possibly thousands of dollars to be used for a” veteran’s rehab center.” The home builder mentioned on the raffle fliers had no idea their name was being used nor did the restaurant the raffle drawing was to be held. In addition, Rhoades used senior citizen employees through an AARP program but never paid them. Any money that was collected during fundraising was immediately taken by Rhoades and former employees claim there were no receipts or books kept. Also in checking with the IRS, Veteran’s Outreach Mission Inc. nor Bruce Rhoades hold any non-profit or 501 (c)3 status or registration. Now how this involves Texas, as of Oct. 18, 2011, Mr. Rhoades has now registered Veteran’s Outreach Mission Inc. with the Dallas County court clerk at the address of 1100 W. Main Suite 115 Grand Prairie, TX. That location comes back as a hotel room. We wanted the legitimate veteran groups in Texas to be made aware of this scam and any possible conflict with their efforts to assist veterans. Please see the links to our stories at KFOR.com and the attached information. We will continue to pursue this story in an effort to assist law enforcement and veteran groups. SAN ANGELO, Texas — Being identified as a veteran can have benefits, ranging from discounts on special events to taking advantage of deals that vendors want to offer those who served in the armed forces. In aid of the identification, Texas veterans now can have their veteran status listed on their driver's license. "It's another venue for veterans" to establish their identify," Tom Green County Veterans Services Director Tim L. Vasquez said. The Texas Department of Public Safety office at 1600 Loop 306 is ready to accept people wanting to put the veteran's mark on their driver's license, which is the word "veteran" printed in black font along with other demographic information. The cost is $11, DPS staff said. Laura Serrano, a veterans service officer with Tom Green County, said the fee is waived for veterans who are 60 percent or more disabled. 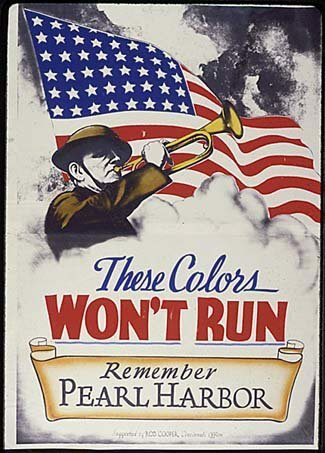 Veterans must bring their DD-214 discharge document. House Bill 1514, which became the law for the veterans' designation, states the designation is available for any branch of the armed services and the Texas National Guard. The designation is available only for those with honorable discharges. "There are so many different levels of discharge," Vasquez said. "For some ... there might be some heartbreak" in not being able to get the designation. The law went into effect Sept. 1, but it only started to be put in practice Jan. 1. Vasquez was told the delay occurred because there wasn't any software in place to print the designation. He doesn't know of anyone who has gotten the mark. "It's not the only venue" for veterans to show they are veterans, Vasquez said. They also can use cards that show their membership with military retired status ID and veterans' health care card, Serrano said. "We're going to have to educate, not only the veterans, but the merchants," Vasquez said. Congratulations to Marla Galves for being the 2011-2012 Gold Medal Winner for Emergency Services 1st place winner for the Department of Texas VFW. She was entered by Katy VFW 9182. Conroe #8 in state - #3 in Division 1. The district is 93.57% of membership at this time. We sure could use a few new or reinstated members It's time to go over your unpaid list and contact each member. We need to get to 95% real soon. Our next District 17 meeting is scheduled for February 4, in Porter (10am). We will be having a District 17 party on Friday, February 3, from 7 pm until 11 pm in the Porter club. The Porter post will be providing the entertainment (D.J.) and a pot luck meal. Our Department of Texas Commander John Spahr will be attending. We will have ourMemorial Remembrance Ceremony during the joint meeting that Saturday. As you know, it is required that each post send at least 1 member to this meeting. If your planning on attending the party and staying the night, there is a very nice La Quanta in New Caney at 22025 Hwy 59 (77357) 281-354-1904. Remember: Post Audits are due at the end of this month. We need Caldwell, Sealy, Huntsville, and Hearne sent in to have all post in on time. The next Veterans Project (Vietnam Peace Accord) is January 27. Several post only need one more project to meet the requirement set by the Department. Texas VFW Mid-Winter 2012 will be 26-29 January at the Doubletree Hotel Austin, TX. For VOD Banquet info and proposed agenda follow the link below. VOD Banquet tickets may also be purchased online at TexasVFW.org. Go to Admin > Purchase Tickets. - Terry B. Please Right Click this line to download pdf to see information. January 27th and 28th. To Benefit Homes for Our Troops, building adapted homes nation wide for severly wounded veterans, at no cost to the veteran. A Concert is on January 29th featuring Chris Brade, Texas Tenors, David St. Romain, Kevin Black and Starring Mark Chestnut. Support the Girl Scouts, who Support Our Troops. Please see the information below regarding the upcoming FREE Veterans Legal Clinic in Montgomery County, January 28, 2012 from 9 am – 12 pm at VFW Post 4709. Thank you for your help spreading the word about this important service to our Veterans. (The Woodlands, Texas – January 11, 2012) Veterans in 14 counties in southeast Texas will have increased access to legal services through a new coalition of bar associations and legal communities beginning in September. The Houston Bar Foundation, the Jefferson County Bar Foundation and Fort Bend Lawyers Care have been awarded grants from the Texas Access to Justice Foundation to recruit and train attorney volunteers and to set up Saturday legal clinics where veterans can get legal advice and pro bono representation. The second clinic in Montgomery County will be held from 9:00 a.m. until noon on Saturday, January 28, 2012 at VFW Post 4709, 1303 West Semands, Conroe, TX 77301. No appointment is necessary. The Montgomery County Bar Association and The Woodlands Bar Association are assisting with the January 28th clinic. The Veterans Legal Initiative will expand services already provided by the three grantees, including the HBF’s weekly Friday afternoon clinics at the Michael E. DeBakey VA Medical Center and Saturday clinics in Jefferson and Fort Bend counties. A schedule of Saturday clinics throughout the 14-county area will be posted on websites and information will be distributed to veterans’ organizations, social service agencies and other groups that serve veterans. Greetings to all in District 17. The Woodlands - #19 in state - #4 in Division 3. The district is 92.73% of membership at this time. We're counting on every post making at least 93% by Mid-Winter. (We sure could use a few new or reinstated members turned in this week.) It's time to go over your unpaid list and contact each member. Mid-Winter is scheduled from January 26 - 29 2012 in Austin. Remember: Post Audits are due at the end of this month. Please don't wait until the last minute to get yours in. New Years is behind us and I hope all your teams won over the weekend. Texas finished the year at 87.77% in membership, down some from this time last year. The bad news is that that puts us about 38th in the country. The good news is, we have plenty of room above us to succeed. Now, it's time to get to work. Please contact your posts and give them a target for Mid-Winter. We will be hosting the National Commander-in-Chief and we need to show him what Texas is capable of. I'd like to see all Posts at 93% and all Districts at the same level. We have a number of Posts that are doing a great job as far as membership, with a pretty good amount in the Top 10 nationally in their divisions. So now, we need to start concentrating on those posts under 93% and get them on the path to success. For the next few weeks, have them contact all of their members who have not renewed yet and ask them to get their renewals in. If the Post is in a small town, have the Commander or Quartermaster stop by the member's house and pick up the renewal. This "face-to-face" contact may inspire that member to start spending more time at the post knowing the Post cares about his membership. Go over each post with the Commander. In some cases, a post may only be 5 or 10 away from 100%. Encourage them to put that Relief Fund to good use and help out some of their members by paying this year's dues. At Mid-Winter, I and the Vice-Commanders will be sitting down with each of you to go over the rest of the year. Please bring your plans and ideas on how to get your District to our Mission Objective of 103%. As always, if I can help you in any way, please feel free to get in touch with me. Best regards and wishes for a successful 2012. If your trying to be an "All State Post" this year remember that you get an extra 10 points for every 1% you go over 100% in membership. Of the top 20 post in the state right now only 1 post is not at 100%. The sooner you make it and continue to sign up new members, the better chance you have to finish in the "Top 20." The district is 92.45% of membership at this time. We're counting on every post making at least 93% by Mid-Winter. It's time to go over your unpaid list and contact each member. Remember: Post Audits are due at the end of this month. Please don't wait until the last minute to get yours in. Four post have already turned theirs in. WASHINGTON (Oct. 21, 2011)- Today, Secretary of Veterans Affairs Eric K. Shinseki announced that the Department's Gulf War Veterans' Illnesses Task Force has completed the draft of a comprehensive report that will outline how the Department of Veterans Affairs (VA) addresses the concerns of Veterans who deployed during the Gulf War in 1990 and 1991. "This report provides a roadmap for our continued enhancements in our care and services we provide to Gulf War Veterans," said Shinseki. "We will be applying lessons learned from this report to Veterans of all eras." Notification of the draft written report is published in the Federal Register, and the draft written report addresses seven areas where VA provides services for this group of Veterans. Over the past year, the task force has examined, evaluated, designated and adjusted the initial roadmap outlined in last year's report. VA has designated steps to improve care and services to Gulf War I Veterans and these improvements are becoming a part of our culture and operations. This year's report focuses on improvements in the delivery of health care for Gulf War Veterans. One of the most substantial additions is modifications to clinical care models used for Gulf War Veterans, which is the most critical point of service VA provides. There are better linkages between specialty knowledge and services at the basic point of care. Clinical research and development is significantly contributing new concepts and methods to clinical practice and clinical education throughout VA.
Two new positions were established in the Office of Research and Development for deployment and Desert Shield and Desert Storm health-related issues. Both positions have been filled and are enhancing research efforts for Gulf War Veterans and will continue to do so in the coming years. VA is also strengthening partnerships and medical surveillance to address the potential health impacts on Veterans from the environmental exposures on today's battlefield. Additionally, VA continues to use social media to improve communication with Gulf War Veterans. The Chairman of the Gulf War Veterans' Illnesses Task Force is John R. Gingrich, chief of staff at VA, a retired Army officer who also served in the Gulf War. "To ensure we are tracking the needs of our Veterans, we want to get feedback from Gulf War Veterans on this draft report," said Gingrich. "Their feedback is critical to our efforts to understand and serve their specific needs. Therefore, we hope they take advantage of one of the different opportunities to provide feedback that we have created for them." VFW Post 12024 & Ladies Auxiliary have been invited to participate with the Opening and Flag Ceremony for the Girls Scouts, Saturday, Jan 14, 2012 at 10 a.m. Ceremony set to begin at 10:15 a.m. at the Girl Scout Camp Arnold in Conroe Texas. If you can help or want to attend, please let me know. I have Carl, Everett and James who have definitely agreed to help, myself so far for our Auxiliary. Susan has also graciously invited those of us who would like to stay and have lunch with the scouts to please do so. Take I-45 North to League Line road - exit and turn right. At dead end turn left - approx 1 mile up on right there will be a sign noting Camp Agnes Arnold turn right into drive and follow signs around to Camp Arnold parking area. Jan 13 – Tues, 9am Nurses Appreciation …. Deliver trays to Regent Care, VA Clinic in Conroe Texas. Congratulations to VFW Post 4709 in Conroe for regaining the top spot in District 17 by making 100% in membership. Conroe #9 in state - #3 in Division 1. The Woodlands - #18 in state - #4 in Division 3. The district is 90.85% of membership at this time. We're counting on every post making at least 93% by Mid-Winter. I't's time go over your unpaid list and contact each member. Gold Medal: District Winners - Law Enforcement from Katy Post 9182. Paramedic/E.M.S. from Katy Post 9182. Firefighter from Conroe Post 4709. Thanks to David Helton and his team for judging this contest. Our next District 17 meeting is scheduled for February 4, in Porter. We will be having a District 17 party on Friday, February 3, from 7 pm until 11 pm in the Porter club. The Porter post will be providing the entertainment (D.J.) and a pot luck meal. Our Department of Texas Commander John Spahr will be attending. We will have our Memorial Remembrance Ceremony during the joint meeting that Saturday. As you know, it is required that each post has at least 1 member at this meeting. We were only missing 1 post at our last meeting. Mid-Winter is scheduled from January 26 - 29 2012 in Austin. I received a very nice call from our Department Sr and Jr Vice Commanders wishing each of you a special holiday season and thanking us for doing a great job for our VFW. I've also forwarded the January e-mail letter from Commander Spahr to each of you. Yes, we need help - any age can participate. Clean-up day is simply the day we remove the wreaths. They are live wreaths, so before they get completely brown and unsightly we remove them. There is no ceremony, no meeting, no paperwork, no sign up, just a job to get done. We start at 9:00am on Saturday, January 7th and simply get the wreaths to one of the 9 dumpsters that will be placed around the cemetery. The easiest way to do it is with a pole like a rake handle where you can string 10-15 wreaths instead of carrying them on your arm. Others use a rope and pull 40-50 at a time. Whatever works for you. With enough help, we should be done in about 2 hours. Come on out - you will get some good exercise and the kids have a lot of fun throwing wreaths. VFW Post 12024's Motorcycle Unit 1 member Shawn Hinch, a member of VFW Post 4010 Missouri City received the call late afternoon yesterday that a kidney was available! This morning at 5:45 he went into surgery. At 12:30 his wife, Melissa, announced that he was out of surgery and the kidney transplant was successful! He has a lot of recovery ahead of him. He will be in University of Texas Medica...l Branch Transplant in Galveston for about a week. Please keep Shawn and his family in your prayers. The Post Meetings for the VFW and Ladies Auxiliary, January 5th, 2012 at 7 p.m. The meetings are open to prospective new members, please be early to make sure the meeting can start on time. South County Community Center, 2235 Lake Robbins Drive, The Woodlands TX 77380. We hope you have a Great Holiday Season and a Happy New Year. The Woodlands VFW Post has finished the year in the top 25 in Texas, jumping all the way from the 70's up to 22 a week before. Having our members stay current in their dues and being highly active in the community make a difference not only for those that we are helping, but for our standings in the state. The Post web site and the Post Facebook page have helped prospective members learn about the Post, the last 4 new members contact us to join from the Post web site or Facebook. The New Year starts in less than a week and the challenge is to be even more active in the community. Getting eligible veteran's to join the Post can only lead us to be able to do more. The VFW's motto is "Honoring the Dead by helping the living". It's up to every member of the Post to help with membership and helping at the events. In the coming year, lets strive for each Post member to be more active in these areas, let the prospective new members know about our Post web site and Facebook pages, as these tools are great PR tools because they actually show what the post is accomplishing. When talking to prospective new members, remember to also let them know that we have a very active Ladies Auxiliary and Motorcycle Unit attached to the Post. If the prospective new members live closer to another Post, offer to help them get in touch with someone at that Post, it's not just about our Post, it's about the VFW as a whole. VFW Post 12024, would like to Welcome Derrel Sims aka Hawk, one of the newest VFW Post members at The Woodlands Texas. Derrell joined the Post on December 1st, 2011, during the Post monthly meeting. He served in the Army and ended his career as a Staff Sergeant, with his VFW Eligibility from serving in Korea. Derrell is interested in the Post having a Color Guard and would like to talk to others that would be interested in this as well. Conroe – U.S. Congressman Kevin Brady (R-Texas) is thrilled his fight to secure a major expansion of the Conroe VA Clinic has been successful with the VA Secretary Eric Shinseki's signing of the request. "The Conroe VA Clinic is a remarkable success, now serving 7,500 area veterans whose families no longer have to make long drives into Houston for routine care," says Brady. "Our community, our veterans and the Houston VA leadership have worked for several years to secure a major expansion of the clinic so this expansion is very good news. I thank and commend Secretary Shinseki for approving and supporting this important expansion for our veterans." The Conroe VA Clinic opened four years ago after a successful community wide campaign spearheaded by Brady, local veterans groups and community leaders. The clinic quickly expanded into adjacent space with additional services as its patient load has more than tripled from its original 2,000 veterans. The next step for the VA is to find a location for an expanding clinic which currently has the largest utilization rate in the entire DeBakey VA system. "The Conroe VA Clinic has an amazing staff and it has quickly become indispensable for our veterans and their families. Conroe VA doctors are already seeing the maximum number of patients allowed by VA policy and last year clinic staff handled nearly 40-thousand outpatient visits," says Brady. "A larger, permanent home will allow this clinic meet the needs of our growing veteran population." Brady applauds the work of Dr. Rajani Potu, clinic medical director, and Rachel Adams, clinic administrator, whose creativity and commitment to local veterans led them for the last four years to find as many nooks and crannies as possible to expand the clinic’s capabilities in its current location. "The Conroe VA Clinic's staff should all be commended, because it’s not possible to see more than three times the patients your facility was designed -- or projected to handle -- without amazing management and skillful use of resources," concluded Brady. "The sooner the VA can open the new clinic the better." Today, I would like to introduce VA for Vets, an outstanding new program to help our Veterans find appropriate careers at the Department of Veterans Affairs (VA). Set to launch on November 11, Veterans Day, VA for Vets takes a high-tech and high-touch approach to recruiting, hiring, retaining, and reintegrating Veterans into the VA workforce. As part of its high-tech solution, the program offers state of the art online tools for Veterans as they seek employment or look to further career development opportunities. The online Career Center includes: a military skills translator that translates military skills into civilian language; a resume builder that tailors Veterans’ resumes so they can more easily compete for open positions in VA; and avatar-based technology that connects deployed Servicemembers back to VA during their operational missions. The high-touch solution comes in the form of career and reintegration coaches who are readily available to help Veterans and Servicemembers take full advantage of opportunities offered through the Career Center or to ensure a seamless transition into the VA workforce. Three new Coaching Call Centers will be operational in Dumfries, Virginia; Ebensburg, Pennsylvania; and New Orleans, Louisiana, starting October 26. As Vice-Chair of President Obama’s Veteran Employment Council, I am confident that VA can set the standard for Veterans’ recruitment and career development at other Federal agencies. VA for Vets is part of a larger strategic initiative led by the newly established Veteran Employment Services Office (VESO) within the Office of Human Resources and Administration. I have set a goal for VA to increase its Veteran workforce from 30 percent to 40 percent, and VESO will be at the forefront of that effort, working with all offices and administrations, to ensure we achieve our goals. VFW Washington Weekly. Please distribute to your posts. Keeping Memories Alive: If your Post is named after a fallen warrior interred overseas, the American Battle Monuments Commission can help you locate and honor his memory both at home and abroad. Each of ABMC's 24 overseas cemeteries would appreciate having on file a photo and story of the fallen, plus cemetery staff would gladly decorate and/or photograph the gravesite for their namesake Posts and family members. Regarding decorations, a Post can contact cemetery staff for theplacement of floral arrangements, which will be photographed and sent back to the Post. Learn more at the ABMC website atwww.abmc.gov. The Texas VFW Magazine honored VFW Post 12024 in the Summer Edition this year by putting two of our very own Members on the back cover of the Magazine. 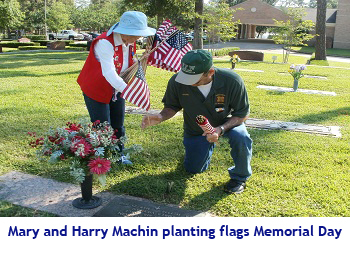 Harry and Mary Machin placing flags over Memorial Day Weekend. For those of you that have not seen this issue or would like a copy of the Magazine, you can right click on the link below and save to your computer or save it to iBooks on an iPad or iPhone. The Magazine is the Property of the Texas VFW, you can obtain past copies from the TexasVFW.org web site. VFW Post 12024 appreciates the spotlight. It's that time of year again, asking members of the Post to renew their membership at the Post. Please contact the Post Adjutant, Post Commander, or Ladies Auxiliary to bring your membership up to date. The Post is also looking for new members to help with all the Post events, the help is greatly appreciated, please come back to the Post and help us with trying to become an All-State Post. The Woodlands VFW Post 12024's Motorcycle Group Unit 1 is having their December Meeting on December 11th, followed by a Christmas Pot Luck dinner at Robert and Jennifer Simard's residence. Members of the Post are also asked to join the Motorcycle Group for the Christmas lunch/dinner starting at Noon. The meats are being handled by Norm and Judy Brawner, with Robert and Jennifer taking care of drinks, desserts, plates and that sort of stuff. Everyone is invited to bring a side dish of some sort. Anything that will go along with turkey and ham and any other desserts that people may want to bring are welcome. The party will also have a white elephant gift exchange. Everyone is encouraged to bring a gift of no more than 20 dollars in value. The address for this Christmas "Pot" Luck is 34 Bowie Bend Ct. The Woodlands, TX 77380. Dec 10, Sat Wreath’s Across America (11am at VA National Cemetery Houston) Individuals may participate, wear your VFW Pride!! Honor all those who were lost seventy years ago at Pearl Harbor and the generation of young men who were lost in World War II. For all the World War II vets and all those who have and currently serve to continue to protect us, Thank You. Dec 3, Sat 10:30 a.m. Flag Changing at South County Community Center, to cover Pearl Harbor Remembrance Day (This will be voted on at the Post meeting on December 1st, please show up at the Post meeting to contribute your vote to purchase flag). 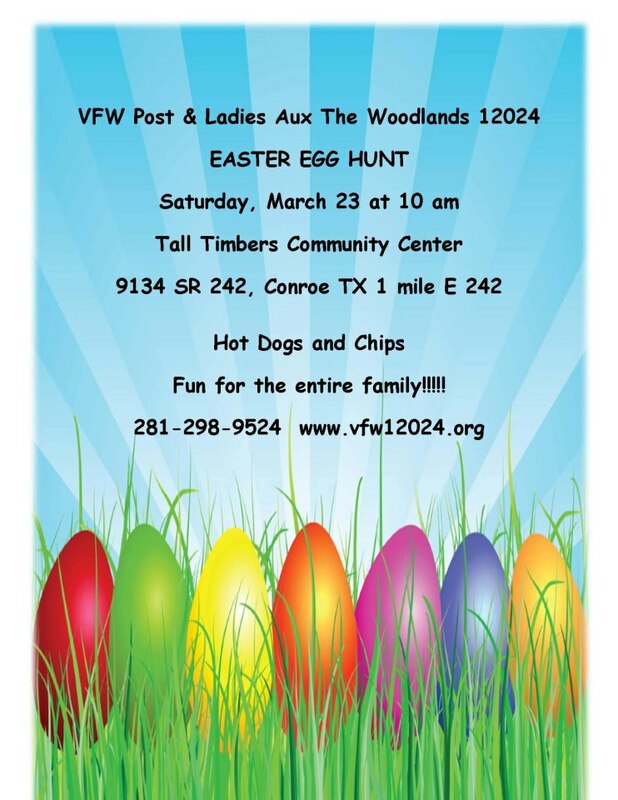 Build Homeless Hygiene Bags at Ladies Auxiliary President Paula Ison & Everett’s home, set for 6:30 p.m.
VFW Post 12024, would like to Welcome Lloyd Peters, the newest VFW Post member at The Woodlands Texas. Lloyd Peters joined the Post on November 3rd, 2011, during the Post monthly meeting. He served in the Navy and received his VFW Eligibility from Vietnam. The Post Meetings for the VFW and Ladies Auxiliary, December 1st, 2011 at 7 p.m. The meetings are open to prospective new members, please be early to make sure the meeting can start on time. South County Community Center, 2235 Lake Robbins Drive, The Woodlands TX 77380. Please show up at least 20 minutes early for this meeting for the Pearl Harbor Ceremony before the Post meeting starts. 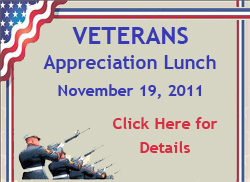 The VFW and Ladies Auxiliary Post 12024 are hosting a Veterans Appreciation Lunch on November 19th, 2011 from 11 a.m. to 1 p.m. The lunch will be at the South County Community Center 2235 Lake Robbins Drive, The Woodlands TX 77380. The Lunch will comprise of Spaghetti, Salad, Bread, Desert and Drink. This is an all hands turn out, needing help from all VFW Post members and Ladies Auxiliary members. All active military and Veterans are welcome and encouraged to attend. Seating is limited, Reservations are required, via email (Ladies Auxiliary President Paula Ison pgison@comcast.net) or phone: 281-298-9524. VFW Post and Auxiliary 12024 invited to attend the Graduation Ceremony for the US VETS program. The ceremony will be held on November 18, 2011 from 4 p.m. to 5:30 p.m. at their Houston location. US Vets is the homeless Veterans group we work with downtown Houston, what a GREAT Way to honor our Veterans!! If you are interested, please contact Ladies Auxiliary President Paula Ison, contact info on Contact Us page. WASHINGTON (Oct. 14, 2011)- The Department of Veterans Affairs (VA) is recognizing Breast Cancer Awareness Month this October by asking all female Veterans to talk with their health care providers about appropriate breast cancer screenings, such as regular mammograms. "The Department of Veterans Affairs has an outstanding breast screening program," said Secretary of Veterans Affairs Eric K. Shinseki. "I urge all women Veterans to talk to their providers during Breast Cancer Awareness Month about receiving the appropriate screening." Both men and women can develop breast cancer, though male breast cancer is rare. In women, breast cancer is the second most common cause of cancer death and the odds that a woman will be diagnosed with breast cancer in her lifetime are one in eight. The good news is that the overall five-year survival rate from breast cancer is nearly 90 percent. If the cancer is caught while it is still located only in the breast, the survival rate increases to nearly 99 percent. A regular mammogram, or x-ray of the breast, is one of the most effective ways to detect breast cancer early. VA excels at breast cancer screenings, outperforming private health care systems, with 87 percent of eligible women receiving screening mammograms. However, VA is concerned that every woman get appropriate screening. Veterans can talk with their VA health care providers. The VA directory, www.va.gov/directory, helps Veterans find their nearest facility. Non-Veterans can find local screening resources through the U.S. Centers for Disease Control and Prevention's early detection program at www.cdc.gov/cancer/nbccedp. "Mammograms can detect breast cancer early, and early detection makes a big difference in a woman's chance of surviving," said Dr. Stacy Garrett-Ray, VA's deputy director of comprehensive women's health. "If you're over 40 years old, talk with your provider about the best screening methods for you." In line with national guidelines, VA encourages all women between ages 50 and 75 to get mammograms every two years. Women ages 40 to 50 and those older than 75 should talk with their providers about the risks and benefits of having mammograms and make a decision based on their individual risk factors. Although rare, a younger woman can also get breast cancer. Any change from normal should be checked out by a health care provider. Breast cancer risk factors include getting older, having a close family member with breast cancer, being overweight or obese, previous radiation therapy/exposure to the breasts or chest, not exercising, and having certain gene mutations. Having these risk factors does not mean that a woman will develop breast cancer, but they should be brought to the attention of her health care provider. Although October is Breast Cancer Awareness month, VA wants women to focus on their health all year round. For more information about women's health topics, visit www.womenshealth.va.gov and click on "Wellness & Healthy Living." A Women Veterans Program Manager is designated to assist women Veterans at each VA Medical Center nationwide. They are available to help coordinate all services, from primary care to medical services to Mental Health and Sexual Abuse Counseling. For more information about VA programs and services for women Veterans, please visit: www.va.gov/womenvet and www.womenshealth.va.gov. VFW Post 12024 and The Local Boy Scout Troop sent care packages last month, this is a letter from one of those Soldiers that received a package from Us. I am SPC Pineda of HSC, 122nd ASB, TF ATLAS stationed here in Bagram Air Base, Afganistan. I would like to Thank you and all the people, organization specially the Boy Scouts Troop 204 for the Care Package Box that you sent me and to all my Buddies here. The Care package you sent me were very useful on our daily living here. I receive a lot of gums which are my favorites, I dont have to go to PX just to buy one now. I hope you wont get tired on what your doing for the soldiers here and everywhere, it keeps us motivated and once in a while forget missing home and our families. I have a 4 year old son and I really miss him so much. I dont get to talk to him much because the MWR internet cafe allows us only to use the computer for only 30 minutes thru SKYPE and there is a long wait to use a computer. If only I knew before I got deployed, that there is no available wireless network here, I could have bought a LAPTOP instead of an IPAD which is useless here. All Laptops are connected by cable and IPAD has no cable to attach to. I regret buying my IPAD. Again I wanna thank you all for your support. Veterans with families are invited to a Post Traumatic Stress Disorder (PTSD) Trauma Awareness Day in the Woodlands. The purpose is to help eradicate PTSD, veteran suicides and veteran family problems. Video presentations of how severe PTSD in veterans from Vietnam to Iraq is resolved quickly and easily with Emotional Freedom Techniques or "energy psychology" (which the Pentagon supports). The Woodlands EFT Tappers, a non-profit volunteer group that has been teaching EFT to the public since 2004, will demonstrate the technique. It takes minutes to learn, and can also be used to stay calm and clear in challenging situations - not only in war, but during e.g. school tests and job interviews; to remove fear phobias, and much more. Handouts & free DVDs. More info & videos at www.grouptapping.com/veterans.html. November 12th, 10:30 a.m. to 12 p.m. (with time for discussion afterwards). Place: Cynthia Woods Mitchell library (1st floor), 8125 Ashlane Way, The Woodlands, TX 77382 (off Woodlands Parkway). TCVO"Hugo Salutes Our Veterans" is a national Veterans Day initiative by a tiny Alpharetta, Georgia-based company, AMG Medical, that gives its state-of-the art Hugo Folding Canes free of charge to U.S. Military Veterans in need of mobility assistance. AMG Medical started the program in 2007 in memory of the then-president's father, who was a pilot in Vietnam, and to honor relatives of the company's employees who served in the military. AMG Medical gave out more than 5,000 canes that year. On Veterans Day, 2009, Hugo Salutes gave away 25,000 canes and in 2010, 36,000 canes. In 2011, Hugo Salutes will give away 36,000 folding canes over three days, November 9, 10 and 11, 2011, through all 600 Sam's Clubs nationwide (membership not required). We are just beginning our outreach for Veterans Day 2011 and we ask that the National Association of State Directors of Veterans Affairs help us get the word out about this generous program via your list-serv, publications or other communications to the state offices. The U.S. Department of Veterans Affairs Public Affairs Office has been supportive of Hugo Salutes Our Veterans since the very beginning, understanding of course that there are restrictions against any commercial endorsement. AMG Medical typically kicks off the program with a local VFW or American Legion post and contributes money to the halls that help us hand out the canes. A copy of the release announcing the 2011 program can be downloaded, click here, it's in Microsoft Word Format. Additional information can be accessed via www.HugoSalutes.com. The Combined Armed Services Junion Reserve Officers Training Corps of the Conroe Independent School District in a Salute to Our Veterans on Friday, November 11, 2011 at Moorhead Stadium in Conroe, TX at 9:30 a.m. RSVP by November 1 to Caney Creek High School Navy JRPTC 936-709-2228. The above is one of the local ceremonies honoring our vets and we need to make the information available to as many as we can. The kids put on a good show, and it is for us, so we need to attend. A new list of Discounts and Freebies for Veterans on Veterans Day is available in pdf format. For discounts for Veterans every other day of the year, check out the Veterans Discounts on the web site menu. The 4th grade class of Glen Lock Elementary is doing a grade level program to honor Veterans for Veterans day on November 10th at 9 a.m. and again that night at 7 p.m. Glen Loch Elementary, 27505 Glen Loch Dr, The Woodlands, TX 77381. Please let VFW Commander Carl Smith or Ladies Auxiliary President Paula Ison know if you would like to attend and possibly what time frame, so they will ensure they have enough room for all veterans and not "standing room" only. This is the school the VFW and Ladies Auxiliary 12024 we provided school supplies for. You can also check the Post Calendar of Events to get directions and set a reminder for this event. VFW Post and Ladies Auxiliary will be passing out Buddy Poppies at the door on both programs, so the Post needs a good turn out to help with this. We as a post will be providing the school with coloring pages for the kids, so we can include them in the Care Packages and take to VA Clinic. The Woodlands Rotary 2011 Veterans Day Program on Thursday, November 10th will honor America's Veterans with a Luncheon. Please share the attached invitation and program with veterans via e-mail or area websites. Copies are also attached in PDF format, if that will work better for web or e-mail sharing. So we will know how many to expect, please ask veterans to RSVP to Teri Woo, 281.292.4155, extension 241. For the past several years, Humble JROTC has honored veterans day through a re-enactment of the Tomb of the Unknown. The ceremony is simple, short but moving especially when we place the wreath. Ceremony followed by free breakfast for all veterans. Realize it is a 40 minute drive but thought there may be some interest. Past years we averaged 50-75 veterans attending. Download a pdf file with information for this event by right clicking on download and select save as. Contact me if you need more information, 936-273-4446. For those of you that may be confused about the 10 propositions on the Nov 8th ballot, the following will help you decide to vote for or against propositions 1 & 2. If propositions 3 thru 10 appear in my Google searches, I will post them as well for your convienence. HUNTSVILLE — Editor’s Note: This is the first in a series of columns by Huntsville’s Legislative Study Group. The series will run on successive days before Nov. 8. On Nov. 8 Texas voters will consider 10 amendments to our state constitution. Prior to election many conversations focus on candidates and neglect consideration of proposed amendments. The Legislative Study Group opted to research the proposed amendments and share our research with the community. The Legislative Study Group is composed of concerned citizens who meet to share research of proposed legislation in order to become more informed voters. Because legislation influences our society, after independent research our group meets to share our research, discuss, and write. We do not always agree but we do enjoy spirited discourse. Sometimes we come to a consensus about supporting or opposing proposed amendments. Because we realize our research may not be all-inclusive on any one subject, we invite readers to share their opinions with us so that we may all weigh the offered information and come to our own conclusions prior to voting. The classification of “100 percent” disability is based on the degree of the veteran’s physical disability; “total disability” is based on his or her ability to work. Using the definitions provided by the federal Veterans Administration, a veteran may qualify for the tax exemption under either disability category. The law granting tax exemption for 100 percent or totally disabled veterans already exists; the new proposition will continue this tax exemption for the veteran’s surviving spouse. According to the House Research Organization (HRO), to qualify for this continued exemption, the spouse would have to have been living at the qualifying residence when the disabled veteran died and must continue to live there after the veteran’s death. Should the surviving spouse buy a new home, he or she could continue to claim the exemption in the amount of the original qualifying homestead exemption. Tax breaks similar to what is proposed here already exist for different situations. For example, school taxes are frozen for residential homesteaders when they reach age 65. That tax freeze is transferable to the surviving spouse as long as the person is at least 55 years old at the time of transfer. Applying this rule to surviving spouses of 100 percent or totally disabled veterans is a logical extension of this idea. Although the HRO’s report seems unclear on whether the exemption can be retained if the surviving spouse remarries, the staff of Senator Van de Putte (the author of the proposed amendment) clarified that the exemption ends should this happen. Passage of Proposition 1 is one more way we could support and help our disabled veterans to have peace of mind for their families and to show them we appreciate and value their service to our country even after they are gone. This proposition, if passed, would amend the constitution to authorize the Texas Water Development (TWD) Board to issue additional general obligation bonds on a continuing basis for one or more accounts of the TWD Fund, with the restriction that the total amount of bonds outstanding at any time does not exceed $6 billion. The TWD Board is the official state agency to approve all water development projects of political subdivisions and water supply corporations. Most projects are funded by the TWD Fund because it offers an interest rate below market value. This is accomplished by using the backing of the good name of the State of Texas. Opponents to the proposition point out that taxpayers could be obligated to pay if a default were to occur; however, research from Fitch Ratings shows the Fund is secure enough to “withstand significant borrower defaults”: “The loan repayments and excess cash flows excluding reserves . . . allow for continued... bond payments even in scenarios where 45 percent of loans default over the next four years, without recoveries. This default tolerance exceeds what Fitch would expect for a pool of this credit quality, size and diversification in an ‘AAA’ stress scenario” (reported in Business Wire). The agency has reached the maximum amount of bond obligation under current law and 1.9 billion dollars of new projects are currently awaiting this new authorization. This new authority will not change the mission of the agency in any way. It will allow the agency to do what it was created to accomplish: provide clean, quality water for the people of Texas. Texas is a growing state and without additional water projects and facilities this growth cannot continue. Our group reached consensus in support of this proposition; a vote against it will mean another two years before it can be rewritten and proposed again, and needed projects will be put on a back burner. Loans through the TWD Fund make water and wastewater projects available throughout Texas and, considering that the program is self-funding, Texans will benefit from the increased availability of loan funding. "If the U.S. Congress cannot afford to pay for the lifetime healthcare that military retirees earned after 20 or more years of ardous service, then they should not make so many of them. I rest my case!" On Tuesday, November 8th, 2011, a Constitutional Amendment will be held. One proposition directly affects the Texas veteran community: Propositions 1. Full details follow. Please distribute this message to your individual members, encourage them to get registered to vote, and to vote for the passage of Proposition 1. In the 2011 Regular Session, the 82nd Texas Legislature passed 10 joint resolutions proposing amendments to the state constitution, and these proposed amendments will be offered for approval by the voters of Texas on the November 8, 2011, election ballot. The Texas Constitution provides that the legislature, by a two-thirds vote of all members of each house, may propose amendments revising the constitution and that proposed amendments must then be submitted for approval to the qualiﬁed voters of the state. A proposed amendment becomes a part of the constitution if a majority of the votes cast in an election on the proposition are cast in its favor. An amendment approved by voters is effective on the date of the ofﬁcial canvass of returns showing adoption. The date of canvass, by law, is not earlier than the 15th or later than the 30th day after election day. An amendment may provide for a later effective date. From the adoption of the current Texas Constitution in 1876 through November 2009, the legislature has proposed 646 amendments to the constitution, of which 643 have gone before Texas voters. Of the amendments on the ballot, 467 have been approved by the electorate and 176 have been defeated. The other three amendments were never placed on the ballot, for reasons that are historically obscure. See the online publicationAmendments to the Texas Constitution Since 1876 for more information. The Analyses of Proposed Constitutional Amendments contains, for each proposed amendment that will appear on the November 8, 2011, ballot, the ballot language, an analysis, and the text of the joint resolution proposing the amendment. The analysis includes background information and a summary of comments made during the legislative process about the proposed constitutional amendment by supporters and by opponents. Texas Constitution, Art. 8, sec. 1(b) requires that all real and tangible personal property be taxed in proportion to its value unless exempted as authorized by the Constitution. Art. 8, sec. 1-b(i), added in 2007, authorizes the Legislature to exempt from property taxes all or part of the value of the residence homestead of a veteran certified as having a service-related disability of 100 percent or as totally disabled. Tax Code, sec. 11.131 fully exempts the value of the residence homesteads of 100 percent or totally disabled veterans from property taxes. Veterans are considered 100 percent disabled based on the extent of their physical disability. Total disability is based on employment capability. A veteran may qualify for the tax exemption under either disability category, as defined by the federal Veterans Administration. • the surviving spouse had not remarried since the disabled veteran died. Proposition 1 also would authorize the Legislature to allow the exemption to follow the surviving spouse to a new homestead if the surviving spouse had not remarried after the death of the disabled veteran. The exemption would be limited to the dollar amount of the exemption for the previous qualifying homestead as of the last year in which the surviving spouse had received the exemption. The change would apply starting with the tax year beginning January 1, 2012, and would apply only to tax years after that date. While current law provides a full exemption from property taxes on the residential homesteads of 100 percent or totally disabled veterans, the exemption unfortunately does not transfer to a surviving spouse upon the veteran’s death. The personal loss sustained by the surviving spouse is compounded by the need to pay an unexpected property tax bill. Proposition 1 would solve this problem by allowing the exemption to continue for the surviving spouse. There is precedent for such a measure because Texas already grants certain surviving spouses the right to inherit other property tax breaks. For instance, the school tax freeze awarded to the owner of a residential homestead at age 65 is transferable to a surviving spouse as long as the spouse is at least 55 years old at the time of the transfer. Proposition 1 and its enabling legislation would be a sensible extension of this policy. Proposition 1 also would help contain the cost of the continued exemption by allowing it to follow the surviving spouse into a new homestead property but not to increase. If the surviving spouse moved to a more valuable property, the spouse could exempt only the value of the original homestead. If the surviving spouse moved to a less valuable property, then the more valuable original homestead would be returned to the property tax rolls, and the exemption would follow the surviving spouse to the less valuable homestead. As disabled veterans face their final years, their greatest concerns are about the fate of their families. Proposition 1 would provide them with some peace of mind. We owe this to the service men and women who have sacrificed so much for our country. A spouse who had remarried would not qualify for the exemption or for the transfer of the exemption amount to a new homestead, so the tax break would be limited. By extending the time that certain properties remained exempt from property taxes, Proposition 1 would decrease property tax revenue to local governments, which means other taxpayers could have to make up the revenue loss. The state should not grant tax exemptions when schools, health care, and other essential services are critically underfunded. A valuable homestead property could remain off the tax rolls for many years if the surviving spouse lived much longer than the disabled veteran. The homestead tax exemption for the surviving spouse of a 100 percent or totally disabled veteran should end if the spouse remarried. Under Proposition 1 and its enabling legislation, once the surviving spouse qualified for the full homestead tax exemption or the transfer of the exemption amount to a new homestead, the exemption would continue regardless of whether the spouse subsequently remarried. The remarriage prohibition would apply only at the point the surviving spouse initially qualified for the tax break. The enabling legislation, SB 516 by Patrick, will take effect January 1, 2012, if the voters approve Proposition 1. The provisions of SB 516 are identical to those in Proposition 1. Download the Ballot, right click on Billboard and select save as. (Houston, Texas – October 26, 2011) The Houston Bar Association and Houston Bar Foundation will celebrate Veterans Day with a free legal clinic for all veterans. The clinic will be held from 9:00 a.m. until noon on Saturday, November 5, 2011 at American Legion Post 560, 3720 Alba Road, Houston TX 7718. No appointment is necessary. The Houston Bar Foundation, the Jefferson County Bar Foundation and Fort Bend Lawyers Care have been awarded grants from the Texas Access to Justice Foundation to recruit and train attorney volunteers and to set up Saturday legal clinics where veterans can get legal advice and, if eligible, pro bono representation. The Veterans Legal Initiative will serve a veteran population of approximately 350,000 in Brazoria, Chambers, Fort Bend, Galveston, Grimes, Hardin, Harris, Jefferson, Liberty, Montgomery, Orange, San Jacinto, Walker and Waller counties. Jefferson County will assist veterans in Chambers, Hardin, Jefferson, Liberty and Orange counties; Fort Bend Lawyers Care will assist veterans in Fort Bend County; and the Houston Bar Foundation (HBF) will assist those in the remaining counties. Other bar associations and legal groups in the 14 counties will partner in providing volunteers and facilities for the legal clinics. The Veterans Legal Initiative will expand services already provided by the three grantees, including the HBF’s weekly Friday afternoon clinics at the Michael E. DeBakey VA Medical Center and Saturday clinics in Jefferson and Fort Bend counties. A schedule of Saturday clinics throughout the 14-county area will be posted on websites soon and information will be distributed to veterans’ organizations, social service agencies and other groups that serve veterans. No appointment will be necessary to attend one of the clinics. Any veteran, or spouse of a deceased veteran, can receive advice and counsel from a volunteer attorney in any area of law, including family, wills and probate, consumer, real estate and tax law, as well as disability and veterans benefits. Veterans who need ongoing legal representation and who qualify for legal aid will be assigned a pro bono attorney to handle their case. Honoring Veterans Day, the Post Poppie Drive November 5th, 2011, 9 a.m. to 1 p.m. at Kroger's Shopping Center and Cochran's Crossing. 4747 Research Forest Drive, The Woodlands TX 77381. The Post Meetings for the VFW and Ladies Auxiliary, November 3rd, 2011 at 7 p.m. The meetings are open to prospective new members, please be early to make sure the meeting can start on time. South County Community Center, 2235 Lake Robbins Drive, The Woodlands TX 77380. 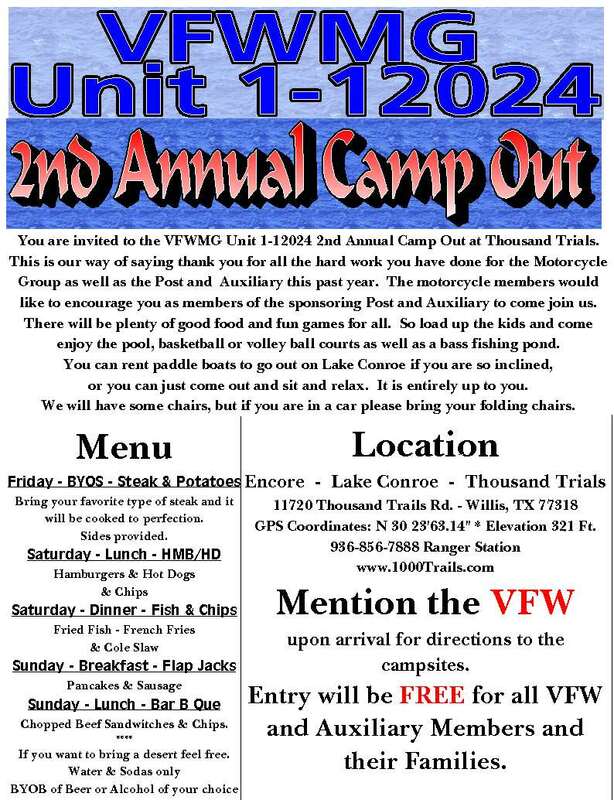 VFW Motorcycle Group of Texas-Unit 1 has a new Facebook page. The page is maintained by VFW Post 12024 Member Robert Simard, a member of the Unit. You can find images and information for this new page at the following link on the Post web site. This makes VFW Post 12024 being the first and only post within the District that has a Facebook page for the VFW, Ladies Auxiliary, and Motorcycle Group attached to a VFW Post. Our post is really showing just how much we do with publishing all of our information to the new and updated VFW District 17 web site, along with our own Post Web Site. This is a total group effort from members from our VFW, Ladies Auxiliary, and Motorcycle Group, please congratulate them and thank them at the next meeting. We may even be the first Post in Texas to show such a broad presence on Facebook and thru Post and DIstrict web sites. The VFW Texas District 17 web site has been updated, it is currently online and operational, however it is missing some information from other Post within the district. Over the next few weeks it should be updated as information comes in. District 17 Commander Macy appointed VFW Post 12024 Jr. Vice-Commander a district chairman as Web Master at the recommendation of Judy Brawner. If you have any suggestions for the District 17 web site or Post 12024's web site, please send an email to vfw12024@gmail.com. Great News, VFW Post 12024 now has a presence on Facebook. The Ladies Auxiliary has had a page for quite a while and it's been great seeing all of the post and pictures. With trying to get the word out about our post, it was decided at the last Post meeting for the VFW side of the house to also have a page. Post Members James Taylor, Robert Simard, and W.L. "Strick" Strickland will be the administrators keeping the Page updated. There is also a new page on the Post Web Site, you can find the link to it by clicking Facebook. If you are already signed up on Facebook, you will see recent post from each Facebook Page, but if you haven't joined, you will only see a Facebook graphic. You can also see the latest live news feeds by going to the News Feeds page, and clicking on the links (useful if you have no intentions of signing up to facebook and want to see what is going on). The quarterly District 17 meeting is taking place at the Brazos County VFW Post 4692 in Bryan Texas, October 22nd, 2011 from 10 a.m. to 2 p.m. Each post in the district is responsible for sending at least 1 officer to this meeting. The 11th Houston Area Stand Down for Homeless Veterans will be held on October 20, 2011, 8 a.m. - 6 p.m., at Emancipation Park Community Center, 3018 Dowling St., Houston, 77004. Donations of clean, useable jackets, coats and sweaters for men and women and blankets will be accepted. Donations are needed no later than Friday, October 14, 2011. To make a donation, contact Derrick Morrison at ext. 6399. Volunteers who would like to assist with a variety of activities during the Stand Down should contact Valerie Watson via Outlook. Supervisory approval is required. Please sign up early and have your name added to the list of volunteers. There will be a special check in and information will be given prior to the event. Cub Scout Family Campout on the weekend of Oct 14-16. The Cub Scouts will be donating items to help our homeless veterans, school supplies, or items to send in Future Care packages. They will have over 400 boys plus their families for about 900 folks. The event happens up at Camp Strake (Conroe). Looking for volunteers that have trucks to help pick up supplies and take to storage on the 15th or 16th of October. Please contact Jr. Vice-Commander Strick Strickland (vfw12024@gmail.com) if you can help. UPDATE: This has been cancelled due to fire restrictions. This will be rescheduled for a future date. VFW Motorcycle Group 1 will be out there on this day also. Contact Norm Brawner for information on the Motorcycle Groups event at the Ren Fest. 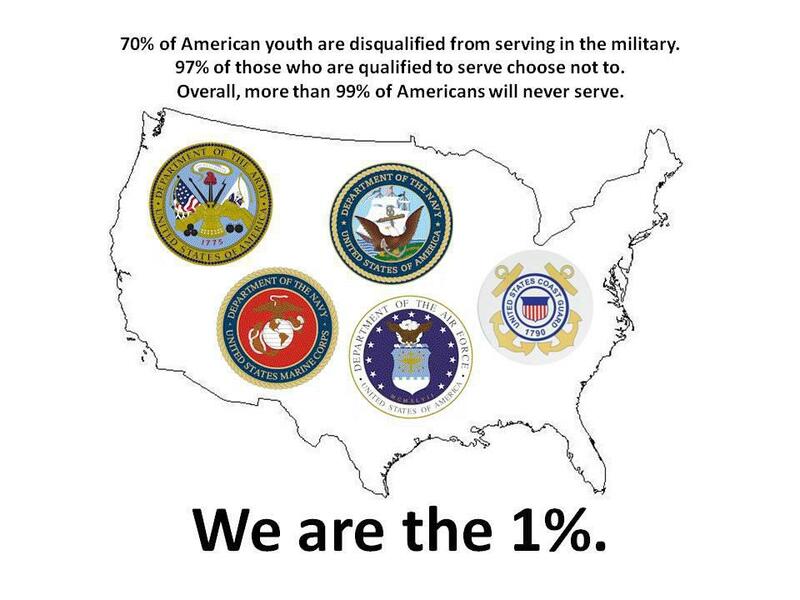 Please help us pass this info along and share this stat with military families. A 2010 New England Journal of Medicine study found that among women whose husbands were deployed, 36.6% had at least one mental health diagnosis, as compared with 30.5% of women whose husbands were not deployed. If you’re a military spouse who is suffering visit: http://www.MindBodyStrength.org/ and take the first step toward healing. The Post Meetings for the VFW and Ladies Auxiliary, October 5th, 2011 at 7 p.m. The meetings are open to prospective new members, please be early to make sure the meeting can start on time. South County Community Center, 2235 Lake Robbins Drive, The Woodlands TX 77380. The Post will be having a Birthday Celebration for the VFW's 112th, before the Post Meeting Starts. Starting at 6:30 p.m.
Training a local Cub Scout Pack the Flag Etiquette - Cypresswood Clubhouse Pavilion 3705 Cypresswood Drive Spring, Texas 77388. October 3 at 6:30pm – 7:30pm. Will be our 1st planning day for the Veterans Appreciation luncheon. Meet at Annie & Carl’s home. Contact Paula Ison or Carl Smith (contact us page for email addresses) for the address if you will be attending. This luncheon is a very BIG DEAL and we want to ensure we are completely prepared for the Big Day, will require everyone’s (Post & Aux) help. Thank you Annie for the offer of your home for this 1st meeting. I’m sure we’ll have more to come. Bring a snack to share….food always makes the work go easier…. Heroes on the Water (“HOW”) helps injured military veterans of all branches with their physical and metal rehabilitation using the therapeutic qualities of fishing and kayaking. Heroes On The water was founded by Jim Dolan, a former pilot in the United States Air Force, in 2007. In less than four years, HOW has grown to be a nationally recognized organization with over 35 chapters that gets our wounded military vets out and about after they return home from their military assignments. Creating smiles, working with hospitals, and getting our wounded veterans out in nature is HOW’s core philosophy. The gates open at 4pm, music starts at 5pm, and will end at 11pm. We are looking forward to a great concert! The Texas Music Throwdown is a fun event for the whole family. It takes place on October 1, 2011 at Town Green Park in The Woodlands. Tickets are available at the gate and are only $5.00 for adults and FREE for kids 10 & under. The Texas Music Throwdown is more than just a concert to entertain. It is a way to raise awareness and support for such a wonderful organization like Heroes on the Water. Without these courageous veterans we may not enjoy the freedoms we have today, and it is our time to give back and say thanks. When you get a second, please check us out on Facebook and www.TexasMusicThrowdown.com and give me your thoughts. If you have any questions or would like more information, please do not hesitate to contact me. Thanks in advance for your time and support! October 1st, 2011 from 4 p.m. to 11 p.m.
VFW Post and Ladies Auxiliary will be having a National Nite Out October 1st, 2011 at North Shore Park from 1 p.m. to 5 p.m., if you can “table sit” for a bit, that would be great. It’s your move, make it count. Did you know? Prostate cancer strikes one out of every six men. Put the odds in your favor by getting checked. Sign up for a free prostate-specific antigen (PSA) blood test and digital rectal exam (DRE). Screenings should begin at age 50. African-American men and others with a family history of prostate cancer are at higher risk and should begin screenings at age 45. Through The Woodlands Bar Association, the Veterans Legal Initiative of the Houston Bar Association is hosting a Veterans Legal Clinic Saturday, September 24th from 9 a.m. until 12:00 p.m. at VFW Post 4709 in Conroe to give advice and legal counsel to all veterans, active-duty military & spouses. There will also be a representative on-hand from the Houston Volunteer Lawyer Program to assess ongoing representation needs, as well as Veterans benefits. This is the first of 3 clinics to be held in Montgomery County over the next year and we look forward to spreading the word to our Veterans. If you have any questions, please feel free to call. Saturday, September 24, 2011 from 11:00 am - 5:00 pm at VFW Post 4692 in Bryan Tx. Bobbie (the wife of Past District Commander Rick Olivares) is completing her chemotherapy/radiation therapy treatment for breast Cancer. Events will include a 50/50 raffle, turkey shoot, auction, and a cake walk. A meal of spaghetti, chicken spaghetti, salad, garlic bread, and dessert for $6.00 a plate. Also live entertainment will be provided by Undecided. Assisting another VFW Post with getting the word out about the 2011 Eugene Jones VFW Post 1907 Benefit Golf Tournament. Please go to web sites download section to download the forms for this event. This event is for September 24th, 9 a.m. to 5 p.m.